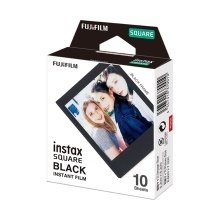 Square instant films specially designed for instax SQUARE SQ6,SQ10 instant camera and instax SP-3 smartphone printer. White frame or black frame for option, 10 sheets in total. 72 * 86mm / 2.8 * 3.4in photo paper size, can be placed into your wallet or pasted onto your notebook/ postcard. 62 * 62mm / 2.4 * 2.4in square image size, with blank edge for you to write something about the photo.